I couldn’t let the week pass by without paying mention to a rather cool development in the realm of access. While you may be as shocked as I was to learn that Senegalese-American Akon is not just another pop star, I was pleasantly surprised to hear of his solar academy venture which is a smart way of using our own resources for sustainable development. The academy forms part of his “Akon Lighting Africa” initiative which aims to provide electricity to millions across the African continent. 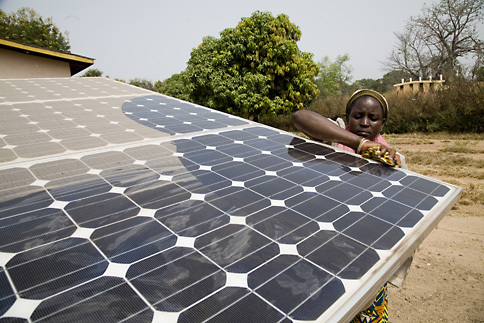 The solar-power initiative officially started in February 2014 with singer Akon, leader Thione Niang and entrepreneur Samba Bathily at the helm and has been received with a lot of positivity thus far. The solar academy is set to open in the last quarter of 2015. Its main goal is teaching participants how to install and maintain solar-powered electricity and microgrids which really capitalizes on our continents resources (since we have about 320 days of sunshine in that region). The academy will be based in Bamako, the capital of Mali. With the help of engineers from Europe, the academy will be a place of training and will provide access to much needed resources and equipment. There is a need for sustainable jobs with long-term benefits which is why I am quite happy to see how much will come out of this venture. These solutions will allow for longer trading hours, which will in-turn increase economic activities for night-traders that helps them become self-sufficient in the long run. It is a private-public project with a number of partners (including Solektra Int, Sumec and Nari), which has already seen a number of solar solutions like street lamps, domestic and individual lighting kits installed in about 14 different countries on the continent. According to Bathily, the business model has been tried by the World Bank and will allow for government-subsidized installation with commercial companies taking on the additional risk and collecting the payments by themselves. In partnership with solar panel manufacturers and others, the project has secured a roughly USD$1 billion credit line that allows it to help broker longer-term financing for governments that would otherwise not be able to afford it over a one year cycle. Governments can then use the loans to finance public utilities like street lights and to subsidize the installation of community solar kits. The nice thing about this is that it isn’t restricted to Governments alone. Households in certain communities connected to the microgrids can utilise the prepaid electricity system until they have paid for the product completely and it belongs to them. Hows that for solar innovation? Although it currently it might seem like a higher cost to implement in individual homes, in the long-term it gives back in a way that allows people to be self-sufficient and light their own futures in a way that won’t cost them anything. ← Net Neutrality: An Avenue to Access?